For use with 2016-2017 Special Edition BREMBO Front Brake Caliper EQUIPPED Models. This is a fast easy way to lower your bike on the street or at the track to provide for more level ride height. At the track these are used to adjust the front end height to control weight transfer during launching. These are the brackets that you have to use with Radially Mounted Brake Calipers to attach the front end lowering straps. CNC Machine from 6061 Billet Aluminum and provided with stainless steel corrosion free hardware. These are sold by the pair one for each fork tube. Strap is may be needed to complete installation. Powder coat black satin finish radial mount caliper bracket kit. Warning: Use of these will make your front end ridgid. They are not inteded for use on the street. This is a drag racing product and is inteded for off road closed course use only. Supplied as pictured and includes 4 caliper bolts that are not shown. 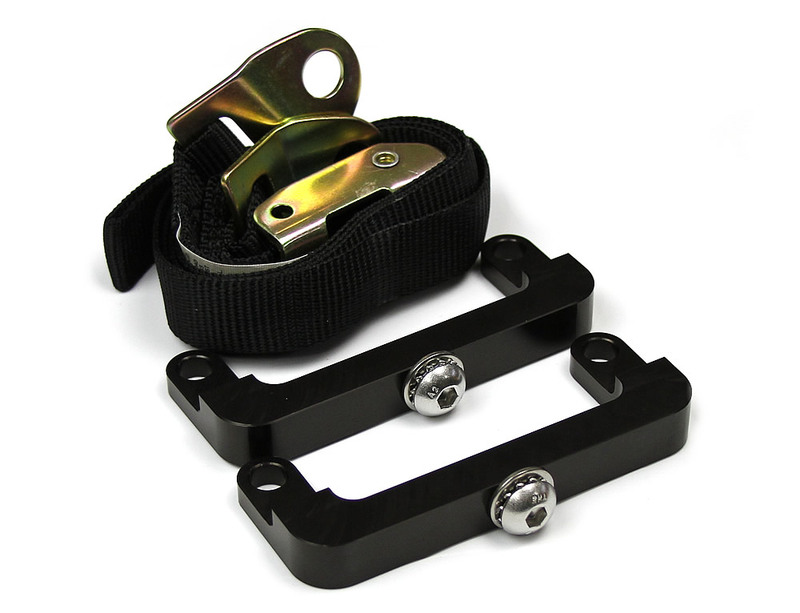 Click the button below to add the Radial Mount Front End Strap Bracket Kit Kawasaki ZX14R SE (16-17) to your bike build.